Tony borrowed Nick’s sea creature costume from last Halloween, nice. Tony did the two mile soft sand run and we cheered him on. A nice beach day! Nick threw a ball at the waves and let the waves bring it up to shore for him, for about two hours straight. Joe would pretend fall and then give us the thumbs up sign. crazy fart bags! Tomorrow is the “Monster Mile” at Junior Guards and the kids are supposed to dress up. Big Tony had the idea to get temporary tattoos for the occasion, so that’s just what we did! Now that’s a kid who is aware of his mommas picture taking habit! What’s more sad and depressing than having to take a picture of yourself to document that you exsist in the world? I’ll tell you what’s more depressing, the joyful happiness I captured in the bathroom mirror. Just me, my camera, Nick pooping and Joe brushing his teeth. We went to the youth awards ceremony at the fair today because Tony’s chopstick birdhouse won best in class. He was so excited to be getting an award it was really cool to experience it with him! Tony, Nick, Joe and I went to the free movie with Agent 35, Tony’s build-a-bear that he got yesterday for the pier jump. It was nice to hear the boys belly laugh at a cartoon geared for a younger age, I’m dreading the day they start rolling their eyes at the stuff! After Joe’s homework tonight I had him color, trying to help lengthen the amount of time he is willing to stay focused. Boys really are not cut out of school, they would learn so much more marching about the school yelling the ABC’s and flapping their arms like birds and counting their 123’s. 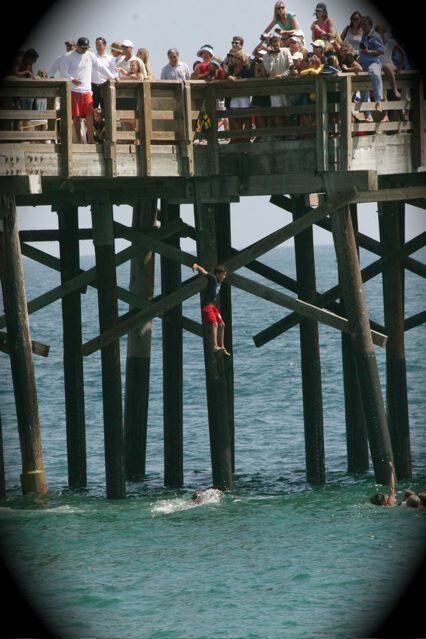 Tony jumped off the pier today. Not in a million years or for a million dollars would my bottom jump, no way, no how! I was so impressed. He hadn’t planned on doing the jump, it isn’t a mandatory part of Junior Guards, but when push came to shove he just went out and did it! Not only did he do it but he was first in his group.